After signing a document held by a man who is mostly nose you will meet your guide Ginger Vitis. Soon appear the nine teachers of Grossology all with blunt paranomasic names. These tutors are masters of the art of ?Stealth Learning,? In other words they mask biology in children?s love of the gross. Zit Attack Game: A Tetris clone with... zits. Booger Block Game: Shirly Snotgrass has snot dripping from her humungous nose, stop them before they reach her mouth. The Drool Show Game: Find out which food will make the teachers mouth water. Burp-O-Rama Game: Listen to the burp pattern and the repeat it. Dr. Sleuth Game: Diagnose patients from what they say, how they look and whats on your handy medical chart. Poo-Poo Pinball: Explanation required? You play a pinball machine/large intestine. Don't Pee Your Pants: Build a tube for Tommys urine before its to late! What A Wound Game: Heal you instructors wound by playing a game of Othello in a open gash in his arm. 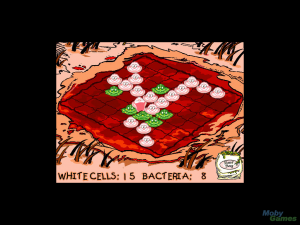 Instead of Black vs White, its White Blood cells vs Germs. Something Special In The Air: A game of concentration involving the appropriate (inappropriate?) subject matter.